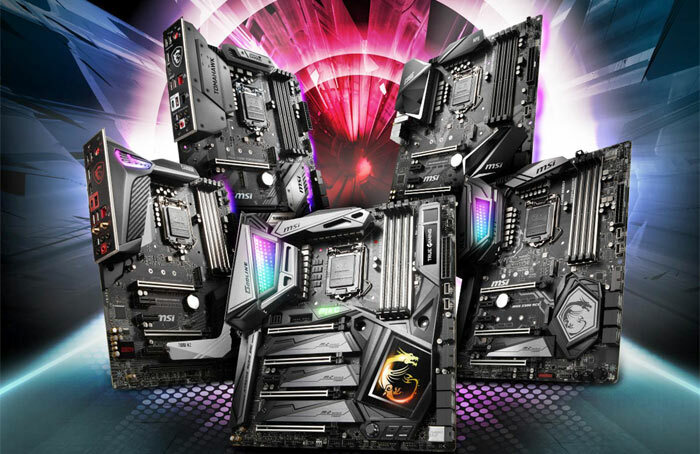 Last week we saw MSI unveil its upcoming Intel Z390 motherboard range in all but name(s). It released an extensive 1hr 40mins preview video showing a large selection of ‘next gen’ motherboards, sidestepping any Intel NDA by taping over packaging designs where Z390 might be mentioned and not mentioning the new chipset in its video analysis. Now those motherboards can be officially revealed, as Intel has launched its Coffee Lake S refresh 9000 Series processors. MSI mentions that Z390 motherboards still use the LGA 1151 socket, common to motherboards in the 300, 200, and 100 Series. However, due to limitations of BIOS and ME (Intel Management Engine), Coffee Lake-S refresh CPUs can only be used in conjunction with the Z390, Z370 & other 300-series motherboards. 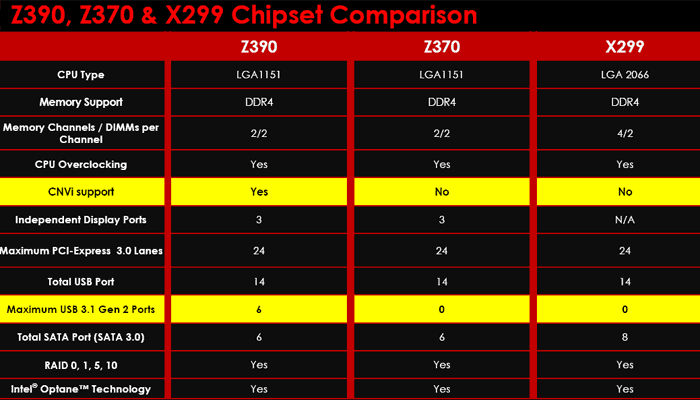 An overview of key spec differences between Z90, Z370, and the X299 chipset is given below. As you can see highlighted in yellow above two of the biggest changes are CNVi support and the maximum number of USB 3.1 gen 2 ports supported. Intel CNVi networking with 2x2 Wi-Fi 802.11ac Wave 2 technology promises up to 1.73Gb/s transfers over two steams and a channel width of 160MHz. Other new things in the platform include; support for i9 on socket 1151, support for up to 8 cores / 16 threads, support for up to 16MB smart cache, and Turbo Boosts up to 5.0GHz. Moving onto the new range being offered by MSI, there are four motherboard sub-brands on offer, the MEG, MPG, MAG gaming boards, and the PRO series for business/creative pros. The MEG series is the pinnacle of MSI’s gaming series designed for maximum performance, and excellence in cooling. 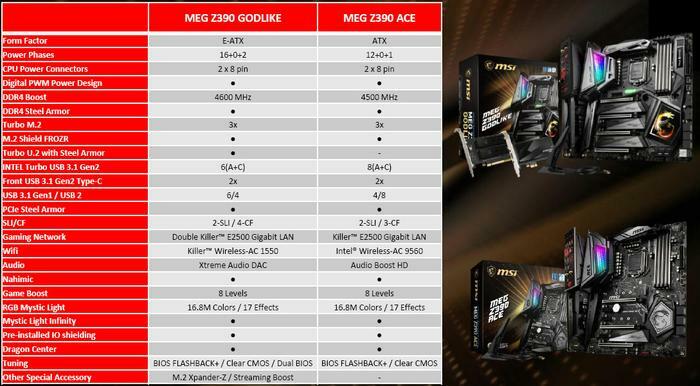 There are two MEG boards initially, the MEG Z390 Godlike, and the MEG Z390 ACE with 18 and 13 phases VRM respectively. 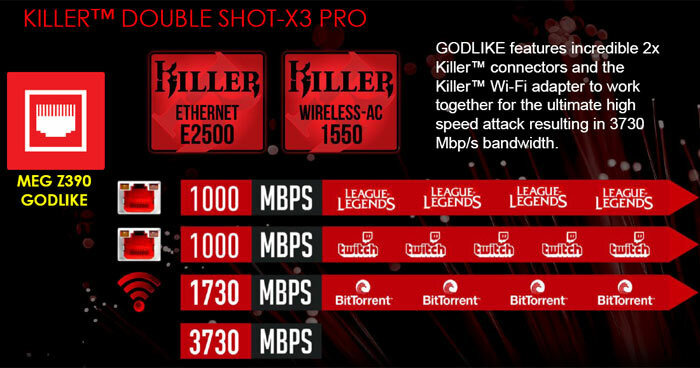 Please check out the comparison tables featuring these two top-end boards below. Headline features throughout the MEG range include; Core Boost overclocking, Game Boost, DDR4 boost and XMP support, extended PWM heatsink and circuit design, temperature management features and fan control, I/O shielding, BIOS Flashback+ system, protections such as DDR4 steel armour, U.2 steel armour, and PCI-E steel armour as well as electrical protections, immersive sound via MSI Audio Boost HD / Xtreme Audio DAC, low latency gaming LAN, Killer Ethernet and Wireless AC, Turbo USB 3.1 and front gen 2 Type-C, Turbo M.2 and Turbo U.2 plus Shield Frozr protection, Mystic Light RGB lighting and extensions, and accessories such as the M.2 Xpander Z, Steaming Boost cards and Wi-Fi antenna. Nestling below the MEG series, the MPG series consist of the MPG Z390 Gaming Pro Carbon AC, the MPG Z390 Gaming Pro Carbon, the MPG Z390 Gaming Plus, the micro-ATX MPG Z390M Gaming Edge AC, and the micro ITX MPG Z390I Gaming Edge AC. As we have moved down from the top end a subset of the headlining features are used on these boards. 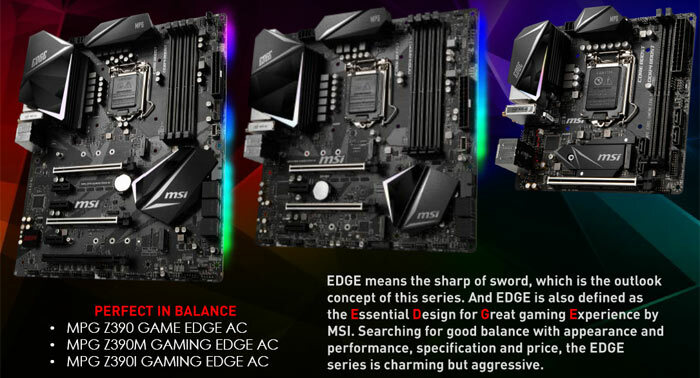 The entry level Z390 gaming boards from MSI are the new MAG Z390 Tomahawk, and micro-ATX MAG Z390M Mortar. MSI says they come “without redundant and flashy specifications” yet are designed to be your reliable partner with which to “conquer the battlefield”. So far there is just a single member of the PRO series for Coffee Lake S refresh, the MSI Z390-A PRO. This professional board combines high quality components with minimalism to meet demanding business and professional needs. 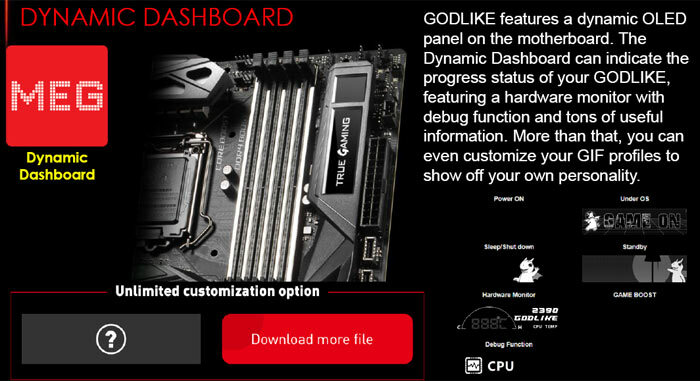 At the time of writing we don’t have availability info for the new MSI motherboards. Pricing ranges from £599 for the MEG Z390 Godlike to £119 for the Z390-A Pro. [Update] A wide range of MSI Z390 motherboards are now available to purchase from Scan Computers*.